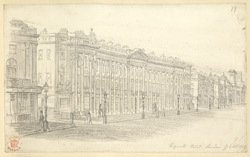 This detailed line drawing depicts the grand architecture found on Regent Street in Central London. The areas of Regent Street and Regent's Park are the most superb examples of Regency town planning to remain in the city. The street, park and terraces were designed by John Nash in 1812 for the Prince Regent, after whom the entire complex was named. The majority of houses were built by 1830, despite the delays caused by the Napoleonic Wars. The park has an open-air theatre where Shakespearean plays are conducted in the summer, and a large zoo that can be found on the north side.